This review is about item#56415878. There is no exhaust leak and it can be used normally. Necessary specifications are sufficient. This review is about item#56415677. I had to remove the muffler when exchanging the tire at address v 125, and at that time I used this muffler gasket. This review is about item#56415792. I needed the necessary parts quickly and it was saved. Exhaust gas leakage from the exhaust manifold also fits perfectly. This review is about item#56415704. There was an exhaust leak, I exchanged. The exhaust leak stopped. I was more firm than the one I was creating, assuming when replacing the cylinder, I purchased several pieces. This review is about item#56415668. I bought it for VTR 1000 F, but I could not use it. The outside diameter is too large to enter. This review is about item#56416045. I bought it for exchanging. Because it is a second-hand motorcycle that does not have maintenance record, it is exchange after purchase. I think that it is genuine equivalent. It is very appreciated to be able to take parts equivalent to genuine. I want you to continue in the future. This review is about item#56416106. I think that quality is as good as genuine parts. It was good that I got it a little cheaply. This review is about item#56415844. This review is about item#56415923. For monkey turnip is much thicker than normal so it may not be attached in the case of one piece muffler when cylinder etc etc are exchanged for external goods by bore up etc etc. 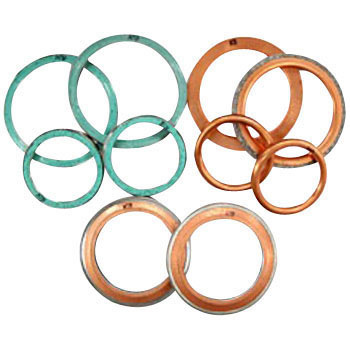 The Honda type copper ring is harder than genuine products, so there is a possibility that the crushing method will not become constant. Please attach it. This review is about item#35764136. It is as good as a genuine product. This review is about item#35764364.